Krishna devotees are sometimes characterized as sentimentalists—at least by those who think that anyone who'd go out dancing and chanting in public couldn't possibly have a sophisticated philosophy. However, in Teachings of Lord Chaitanya we find that at the heart of Krishna-bhakti is a depth of philosophical and theological understanding far beyond most critics' power of conception. Teachings of Lord Chaitanya (subtitled, "A Treatise on Factual Spiritual Life") was first published in 1968. It is a summary study of the Sri Chaitanya Charitamrita, a multi-volume collection describing the life and teachings of Chaitanya Mahaprabhu, who popularized harinama-sankirtana, congregational chanting of God's names, throughout India during the fifteenth century. His movement bewildered the religious establishment, who considered His followers "emotionalists." Mahaprabhu reminded them that sankirtana is recommended in the Vedas—the most comprehensive and time-honored spiritual writings on earth—as the primary process of God-realization for the modern era. Teachings of Lord Chaitanya summarizes Chaitanya Mahaprabhu's conversations with influential scholars—the logician Sarvabhauma Bhattacharya and the Mayavadi sannyasi Prakashananda Sarasvati—as well as His closest followers, government leaders like Rupa Goswami, Sanatana Goswami, and Ramananda Raya. The subject of their talks is Krishna-bhakti, devotional service to Krishna, the Supreme Person. 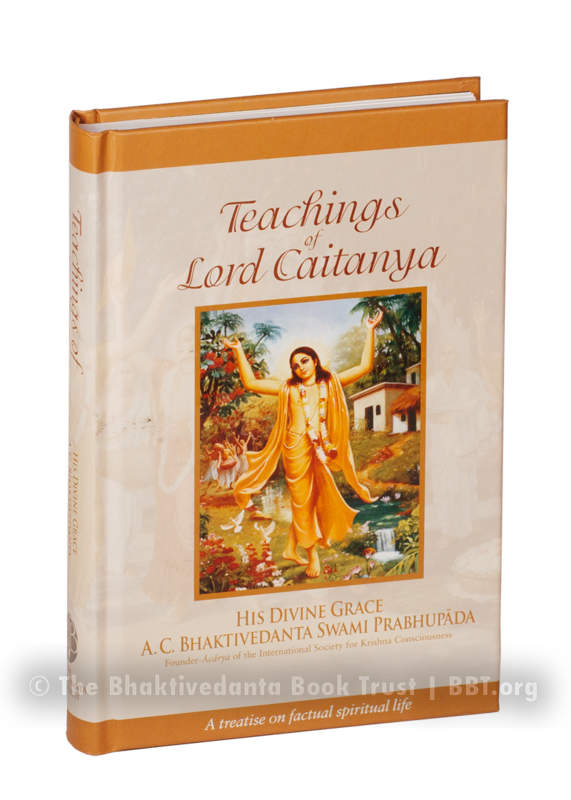 In Teachings of Lord Chaitanya readers will find some of the most elaborate and ecstatic revelations of the science of God found in any spiritual tradition. Srila Prabhupada often referred to it as "post-graduate" theological study—with the Bhagavad-gita as the undergraduate text, and the Srimad-Bhagavatam as the graduate-level course material.